There are so many summer resources at your fingertips: Summer flowers, Red/White/Blue patriotic themes, Beach finds, Kids outdoor toys, Seasonal birds and bugs and more. If you are using a table that you own, decorate according to the table’s appearance. For a red picnic table – go more rustic. For a stainless folding table – go more modern. Check out the area around your table. If the table is located near a tree, decorate the tree! Hang pennants, paper flowers, American flags. You can use chalkboard signs, or even holiday ornaments to decorate the space nearby. Picnic tables should be as colorful as possible to celebrate the summer season. Pick a bright colored or bright patterned table cloth, and set off with solid white dinner plates. Use bright, bold and big centerpieces. Check out Oneida’s Terrace flatware which comes in real cool summer colors such as Sunflower Juniper, Coconut, Rosemary, Berry, and Aqua. And, The Center of Attention is….. Tall plants, bright flowers and potted bushes all make bold, natural centerpieces. Unique vases can include jars, cans or colorful plastic containers. Feel free to layer table linens-especially when setting a more formal table. 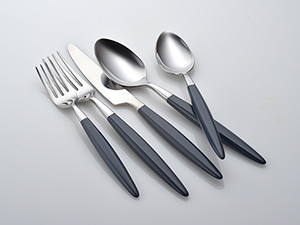 Select unique tableware items including square plates, stemmed glasses, and colored flatware. Classic masonry jars are always a fun beverage vessel.